Soil Corrosivity and Corrosion Rate Determination – Matergenics Inc.
Matergenics – Pittsburgh has created a specialized market in corrosion risk assessment and identification of corrosive hot-spots for underground assets and infrastructure that is not considered by traditional Close Interval Surveys (CIS) and circumvent functioning cathodic protection (CP). Our dedicated lab has rapid turn-around times and is supported by a multidiscipline team of NACE certified materials and corrosion engineers, CP design and installation specialists, coatings specialists, chemists, and lab and field technicians. The combination of field and lab analysis provides essential data for geotechnical, asset management, site surveys, CP installations, and failure analysis. Knowing the corrosion rate of a metallic material is critical to determine the remaining life of underground structures. It also helps to understand whether or not mitigation, coating or cathodic protection is required. We at Matergenics are not only able to determine the corrosion, but we also have the expertise to provide you with a recommendation that is specific to your application. In early studies, the NBS data were used to estimate parameters for different soil types. Forty- seven (47) NBS soil sites were divided into 4 groups based on aeration level, ranging from well-aerated sands to poorly aerated tidal marshes. Instantaneous Corrosion Rate, C.Steel, Galvanized Steel, Stainless Steel, Copper, Brass..
Matergenics have reviewed , all available predictive models and the most relevant regression coefficients are used to predict the corrosion rate for the client’s assets in given soils based on the corrosion performance parameters (above data). Using our unique algorithms developed by expert corrosion engineers, the soil around a buried metallic asset is assigned a soil corrosivity (SC) rating that is based on a number of parameters including soil resistivity, pH, chlorides, sulfates, properties, and linear resistance polarization. These ratings identify high soil corrosivity areas where assets are located and, based on these ratings, decisions for inspection frequency, prioritization, and long term planning can be made with confidence.This is what distinguishes us from our competition. Based on chemical analysis and corrosion performance parameters of the soil we are able to predict the corrosion rate and pitting in the given soil. 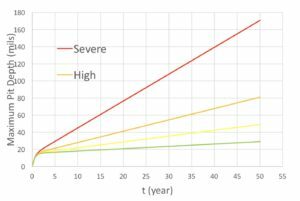 Life expectancy and remaining life is predictable in corrosive soils by our predictive models that are based on field evaluations and laboratory testing of soil. Our capabilities include materials testing, failure analysis, computer aided design of cathodic protection/installation, corrosion risk assessment of underground/aboveground assets and a soil testing laboratory that performs many thousands of soil corrosivity tests each year. What makes us different from other labs is our predictive model for material loss based on soil chemistry and corrosive properties. Our model is based on many thousands of field data and findings and predicts corrosion penetration with moderate to high certainty. We can implement our model for your specific site(s) and provide life or remaining life expectancy for your underground assets based on soil properties at your specific location for shallow and deep burial. MIC Study SRB, APB,… 290 Total Bacteria, SRB, APB, IOB,.. In summary, we can predict the corrosion rate and life expectancy of given underground asset based on chemistry of a soil environment it is exposed to. Having this data will enable you to predict the remaining life and if you must install cathodic protection system to maintain your assets. Please call Dr. Zee at 412-952-9441, Tara at 412-537-6239 or 412-788-1263 and let us know how we can assist you in your soil investigation. Alternatively, you can send your request to info@matergenics.com.